It's the little things that lead to the big changes, right? Steve Ballmer has taken a pay cut from Microsoft this year as the company posted its first ever fall in yearly sales. The CEO has seen his salary fall from $1,350,834 (£847,289) to $1,276,627 (£800,744) in the last year, the result of a $100,000 reduction in bonuses. His basic salary of $665,833 was actually up from the previous year, although Microsoft has said it will be freezing salaries for the financial year in 2010. To be fair to Ballmer, he declined compensation from his shares, which are worth around $10 billion (£6.3 billion), while Microsoft only said it was 'lowering' the amount it gave out. According to Reuters, Microsoft's annual revenue dropped as much as nine per cent, in the 2009 financial year, falling to £12.8 billion and shares slipping 13.6 per cent in the same year. Microsoft will be looking for a strong recovery through sales of Windows 7 in 2010, coupled with a thawing in the economic climate. Other areas of development for the company, including Windows Mobile 7 and the Zune HD, will also be looked at as game-changing options for the company as it looks to return to previous revenue levels. 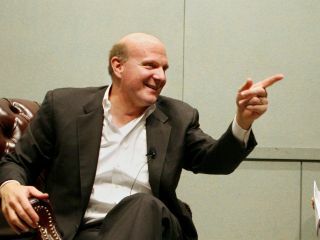 And of course, there's always a chance Ballmer could turn up at CES 2010 and do another monkey dance, although this time he might charge to top up his salary.